Partnership with First Star Greater Washington Academy gives students a preview of college life. 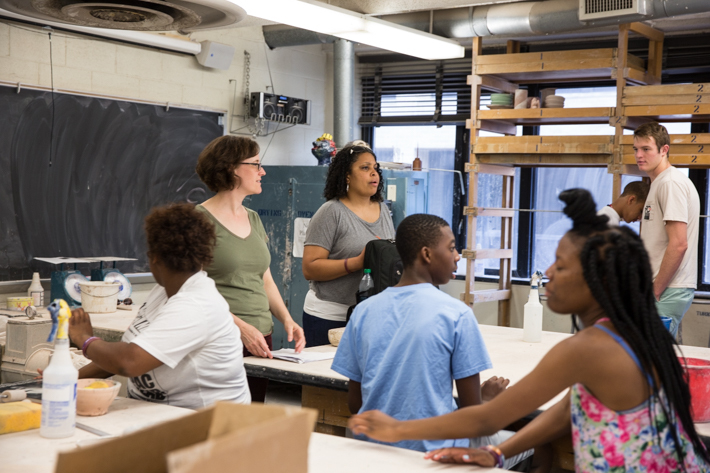 Dandee Pattee, far right, instructs a group of local high school students during her ceramics course. Fifteen-year-old Derrick is a New Orleans Saints fan. So when it was time to pick a color for a ceramics project he's finishing for an academic residency program at the George Washington University, the McKinley Technology High School student chose the familiar gold of his favorite NFL team. “It matches the rest of my room,” he said. Derrick and 20 other local high school students have been at GW since July 7, living in residence halls on the Mount Vernon Campus and taking courses for college credit. Their immersion program is hosted by GW and First Star Greater Washington Academy, a public charity that provides academic support to area foster youth who aspire to attend college. 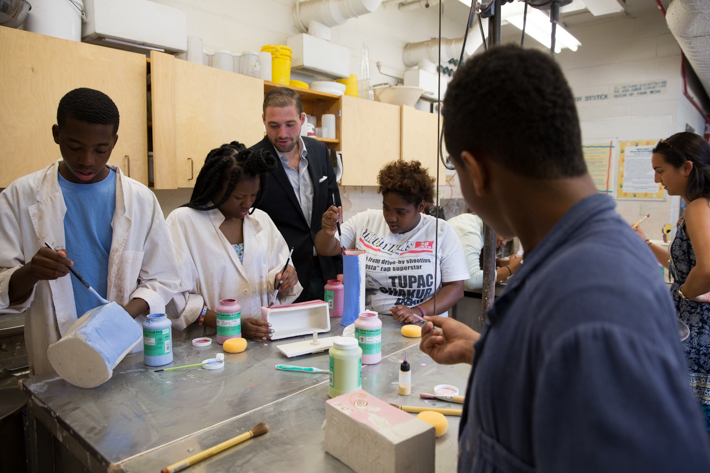 Brian Ritchey, mentor program resident director for First Star Greater Washington Academy, looks on as students work on their ceramics projects. GW customizes existing university classes for the four-week residency course. "Last year students took video reporting," Mr. Ritchey said. "They put together their own news stories, used the software to cut footage, learned how to interview people and put it together into a package." The four-week residency gives students a preview of college life, said Toni Marsh, associate dean for new initiatives in the College of Professional Studies. Foster children, she said, have about a 3 percent college attendance rate (by comparison, the general population is around 30 percent). This is the second year GW and First Star have worked together to host a summer residency for local foster kids (all are from public schools or public charter schools in Washington, D.C. or Fairfax County). In addition to math and English courses, the group also takes one focused elective. Last year’s class was a video reporting course facilitated by Roxanne Russell, an associate professor in the School of Media and Public Affairs. The students this year are taking Handbuilt and Wheelthrown Ceramics—a two-credit fine arts class—under the guidance of Dandee Pattee, a professional lecturer of ceramics in the Columbian College of Arts and Sciences. Ms. Pattee, a professional lecturer of ceramics in the Columbian College of Arts and Sciences, provides projects that combine creativity and composition in a hands-on setting. "There are four main handbuilding techniques they will be learning," she said. "We have all available tools for them to use in one space and many different kilns. They see the whole ceramics process." The projects, Ms. Pattee said, are graded on ambition and thoughtfulness of design. Her course also incorporates elements of geology, chemistry and math through presentations and lectures she gives at the beginning of each new topic. 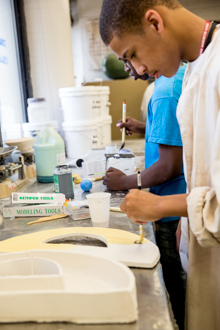 The students are introduced to the artistic, historical, cultural and functional side of ceramics. Derrick applies gold paint to his ceramics project. The residency program, he said, has provided him a glimpse of the academic expectations and social atmosphere of college. "It helps you know what to expect in the future," he said. The residency is also a social experience. Students use the Lerner Health and Wellness Center, ride the shuttle and eat on campus. Each has a GWorld card. For a month, they are younger versions of the GW students who study here full time, said Robyn Ryal, executive resident director for First Star Greater Washington Academy. In addition to serving as a host venue, GW provides mentors for the residency program, many of whom are student athletes. These mentors—generally one for every two to three First Star students—accompany students to class and help with coursework. They are trained by First Star and work with the organization to facilitate discussions with high school students, both during the on-campus residency and through monthly events held during the school year.